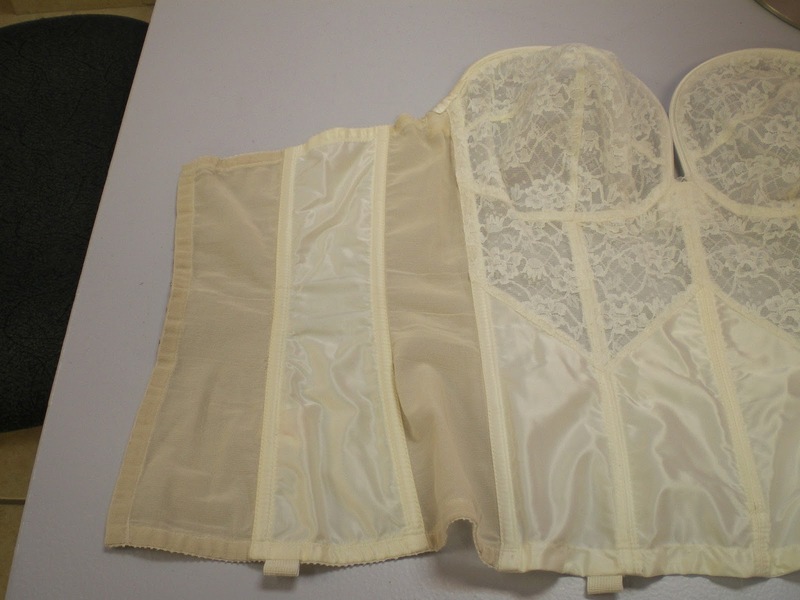 Here’s a great vintage find – an OVERwire garment (as opposed to an UNDERwire garment) that one of my students brought in to a class. The length goes past the waist to the hips, so is it corset, a basque, or just a long bra? It definitely has bra cups and it fastens with hooks and eyes in the back, so it’s not a true corset. It is longer than a bra since it goes past the waist. I’ve put it in the Basque category. So it’s an Overwire Basque, from the late 50s and 60s. The really cool thing about this Overwire basque is the support system. There are no wires underneath., but instead the wire curls from the side seam on one side, over the breast to the bridge area, across the bridge at right angles and back up and around to complete the second side. When it comes to engineering, this is a suspension, rather than a cantilevered structure. The overwire holds the fabric back to the chest wall. I love the plunge, too! An overwire is one of the few ways to have a strapless and a plunge at the same time! The cups are made of rigid lace (no stretch) with horizontal three-piece cup seaming. And they are quite pointy (tee hee!). I am often accused of making my bra designs with this classic profile, so I am glad to see this! The seams of the body of the bra are quite interesting too, with a chevron effect made from the lace and main fabric. Although the solid colour fabric looks like silk, I don’t think it is. The loops on the bottom would be for detachable garters. They are a lot wider than the garters of today: 3/4″ (18 mm) as opposed to 1/2″ (12 mm) today. The back panels are made of strips of power net on either side of the solid fabric, and I don’t know if the power net discoloured over the years, or whether it was always that colour as an interesting contrast. Some mysteries are not meant to be solved, I guess! 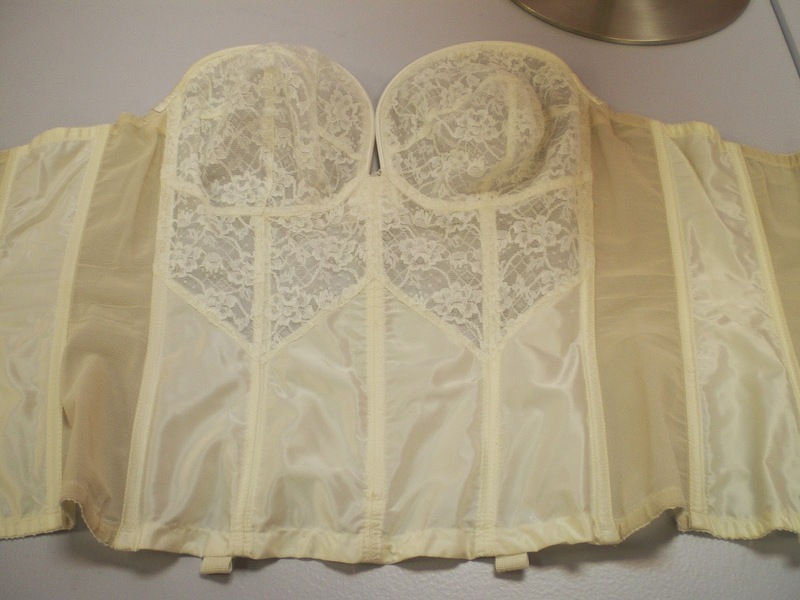 Hmmm… this lovely vintage basque has got me thinking…maybe I need to hunt down a supplier for these overwires. I think there would be a market for them! Anyone agree? I just discovered your website and absolutely LOVE this basque. Will be signing up for your classes-I want to make this! I was delighted when my cardiologist told me one way to manage sudden drops in blood pressure I’d been experiencing was to wear corsets. Now I want a wardrobe of them. Thanks so much for posting.